The Casas Fumando crew has reviewed most of the cigars coming out of Erik Espinosa’s factory in Esteli, Nicaragua. And to say the least, the majority, if not all, received very favorable reviews. I for one have great respect for the cigars produced at Erik’s factory La Zona, with two cigars from the factory landing on my Top 10 Cigars of 2013 list, the MoyaRuiz La Jugada and Espinosa Habano. Browsing around a cigar auction site a few weeks back, I stumbled across a bundle of La Zona Habano cigars up for grabs around $40. With my previous experience with Espinosa Cigars and the exceptional deal on the smokes, I had to jump on it. I’ve been smoking through the bundle like a madman since they arrived in the mail. Daniel posted a full review of the La Zona Habano in 2013, so I am just going to give you a quick overview of the cigar, hence the name “Quick Draw”. La Zona Habano, made up of all Nicaraguan tobaccos, is available in two sizes: Robusto (5 by 52) and Super Toro (6 1/2 by 54). While the Super Toro is at the top end of the ring gauges I prefer to smoke, especially when purchasing a full bundle, the price outweighed my size preference. The Nicaraguan Habano wrapper is consistent in its dark tan color with a good amount of oils. To the touch, the wrapper leaf feels velvety. Through and through, the cigar is packed evenly with just the slightest give. The aroma off the Habano leaf is of sweet barnyard, while the foot gives off more manure and deep earth notes. A quick, clean cut opens up a draw with the right amount of resistance and this has been the case with each one I have smoked. Potpourri spices meet my palate on the cold draw, along with some woodsy notes. The cigar opens with a very unique woodsy flavor that holds strong the entire stick. Unlike the cedar I pick-up on in most cigars, the woodsy notes are piney with some richness and sweetness. There’s a peppery spice that is not overpowering but warms the palate and creamy, thick smoke coats the mouth. At about the half way point, toasted notes and dusty chocolate enter the mix. Allowing time for the La Zona Habano to rest between draws keeps that flavors balanced and pleasant. However, puffing to quickly results in the toasted notes dominating the profile. To fully enjoy this smoke, it’s necessary to pace yourself. 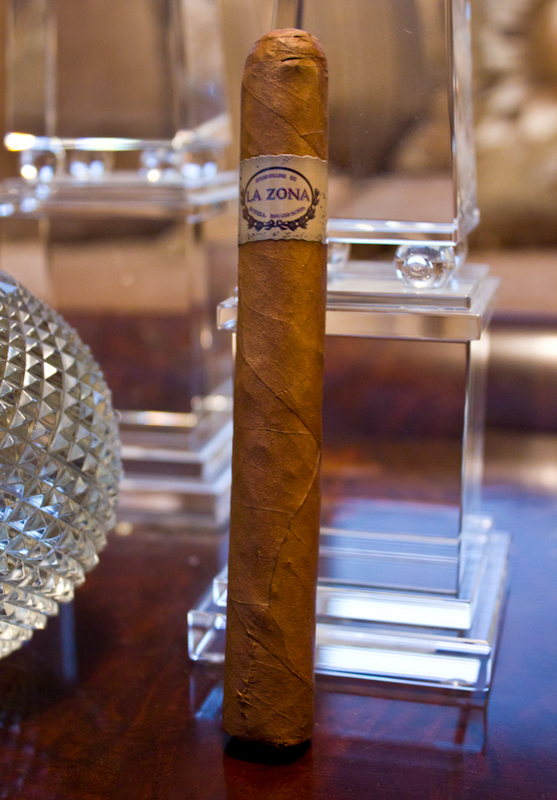 For a valued-priced cigar, the La Zona performed fairly well with three minor touch-ups needed to get the burn back in-line. A flaky, white ash was left behind as the cigar burned down. and a copious amount of smoke filled my mouth with each draw. Flavors remained medium/full throughout with the strength peaking at a solid medium. For a cigar that can be found for under $4 on most days and around $2 on good days, La Zona Habano by Espinosa Cigars is a good stick that delivers without breaking the bank. Finally, due to slacking it, I decided to “steal” Daniel’s photos from his full review that you can find HERE.